The site-specific art installation called "WDCH Dreams" by media artist Refik Anadol is projected onto the undulating stainless steel facade of the iconic Walt Disney Concert Hall in Sept. 2018 in Los Angeles. The Los Angeles Philharmonic's yearlong centennial celebration kicked off at the end of September, with a day-long street festival that spanned eight miles across the city. Angelenos started at the Walt Disney Concert Hall and ended with a free nighttime concert at the Hollywood Bowl, featuring performances from pop star Katy Perry and composer John Williams, who closed out the event by conducting his famous Star Wars theme. The Philharmonic is actually celebrating a little early. It made its debut on October 24, 1919, despite the fact that the city already had an orchestra. Founder William Andrews Clark Jr. had a broader vision: to bring in New York players, get students of composer Gustav Mahler to conduct and build a successful orchestra out of the cultural backwater of Los Angeles. LA was still a pioneer town back then — much of it orange groves and oil wells — and the film industry was just getting started. Three years after the orchestra debuted, the Hollywood Bowl opened and became its summer home, where audiences paid 25 cents a ticket for "symphonies under the stars." The orchestra has continued to be at the forefront of classical innovation. The LA Philharmonic claims to be the first orchestra to broadcast a full concert; it was one of the first to invite a woman to conduct, in 1925; and it was the first U.S. orchestra to hire an African American musician, in 1948. By the early 1990's, Los Angeles had become a huge multicultural metropolis. And similarly, the orchestra has become known for its mix of classical favorites and music by contemporary composers, including John Adams and the late Frank Zappa. The orchestra's current music director, Gustavo Dudamel, continues to champion new music. "I credit him with really crafting the orchestra into the finely tuned machine that we are now," first violinist Camille Avellano says. "It used to be that we were just sort of this unknown guardian of old, dead white guy's music. And now I think we are seen as being cutting edge." Simon Woods, the Philharmonic's new CEO, says the orchestra is committed to taking risks. So committed, it inspired The New York Times to make a remarkable declaration: "The Los Angeles Philharmonic is the most important orchestra in America — period," classical music editor Zachary Woolfe says. "Just in terms of what an orchestra can mean in its community and what they can do in terms of blending the artistic and the social justice, educational, etc." The LA Philharmonic's conductor and music director Gustavo Dudamel has played a large part in the orchestra earning this distinction. Dudamel began at the orchestra 10 years ago, and is now planning a permanent home in South LA for his youth orchestra, a program similar to El Sistema, the one he came through in Venezuela. He's optimistic about the philharmonic's future in the global hub that Los Angeles has become. "I don't see borders in the art. If we can be an example in these chaotic moments that we are living in the world, arts will open this new path that we need. It's a beautiful journey. It's an amazing and unique journey," Dudamel says. That journey, this season, includes premiering 50 commissions from composers and performing during the Academy Awards. You know something is up when The New York Times insists that Los Angeles has the most important orchestra in the country. The LA Philharmonic recently launched a year-long celebration of its 100th birthday. NPR's Mandalit del Barco has this look at the orchestra's rise. MANDALIT DEL BARCO, BYLINE: The LA Phil's centennial celebration kicked off with a day-long street festival that spanned eight miles across the city. DEL BARCO: Angelenos started at the Walt Disney Concert Hall and ended with a free nighttime concert at the Hollywood Bowl, complete with fireworks. DEL BARCO: After pop star Katy Perry sang with the orchestra, composer John Williams conducted the finale, his famous theme from "Star Wars." DEL BARCO: The LA Phil is actually celebrating a little early. It made its debut on October 24, 1919. It was created by William Andrews Clark Jr., the son of a copper baron and U.S. senator. Clark Jr. was also an amateur musician. JULIA WARD: There are some people that say - oh, this was a rich man's toy at first. DEL BARCO: Julia Ward, who edited the new book "Past/Forward: The LA Phil At 100," says the city already had an orchestra. WARD: But it wasn't so great. And he wanted to bring in New York players. He wanted to get students of Mahler to come and conduct. And mostly, also, he just wanted to sit in himself. WARD: One of the first things he said is, I'm going to make this the very best orchestra in the world. And nobody would think that an orchestra would come out of this cultural backwater of Los Angeles. DEL BARCO: LA was still a bit of a pioneer town back then, much of it orange groves and oil wells. The film industry was just getting started. Three years after the orchestra debuted, the Hollywood Bowl opened and became its summer home. Audiences paid 25 cents a ticket for symphonies under the stars. DEL BARCO: In this first recording made in 1928, conductor Eugene Goossens is rehearsing for the West Coast premiere of Igor Stravinsky's "The Rite Of Spring." 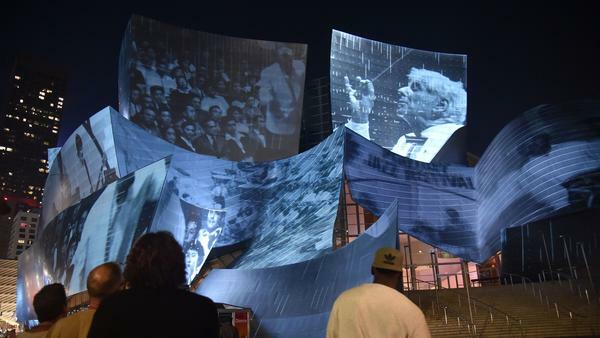 DEL BARCO: The LA Phil claims to be the first orchestra to broadcast a full concert. It was one of the first to invite a woman to conduct in 1925. And it was the first U.S. orchestra to hire an African-American musician in 1948. The LA Phil started to gain international recognition under the leadership of CEO Ernest Fleischmann and conductor Zubin Mehta in the 1960s. DEL BARCO: By the early 1990s, Los Angeles had become a huge multicultural metropolis. In 1992, much of the city was on fire after the acquittal of police officers who beat black motorist Rodney King. That's also the year composer Esa-Pekka Salonen began conducting the LA Phil. CAMILLE AVELLANO: I credit him with really crafting the orchestra into the finely tuned machine that we are now. DEL BARCO: First violinist Camille Avellano says the orchestra's current music director, Gustavo Dudamel, continues to champion new music. And he started a youth orchestra similar to the one he came through in Venezuela. AVELLANO: It used to be that we were just sort of this unknown guardian of old dead white guys' music. And now I think we are seen as being cutting edge. DEL BARCO: Over the years, the orchestra became known for its mix of classical favorites and music by contemporary composers, including John Adams and the late Frank Zappa. (SOUNDBITE OF LOS ANGELES PHILHARMONIC'S PERFORMANCE OF FRANK ZAPPA'S "THIS TOWN IS A SEALED TUNA SANDWICH (LIVE AT WALT DISNEY CONCERT HALL/2013)"
LOS ANGELES MASTER CHORALE: (Singing) This town - this town is a sealed tuna sandwich. SIMON WOODS: You do breathe a little bit of a different air here in California. We can play the most avant-garde, most dissonant, most difficult, most complex music in the world. And people still come and lap it up. DEL BARCO: Simon Woods, the LA Phil's new CEO, says the orchestra is committed to taking risks - so committed it inspired The New York Times to make a remarkable declaration. ZACHARY WOOLFE: The Los Angeles Philharmonic is the most important orchestra in America - period. DEL BARCO: Zachary Woolfe is a Times classical music editor. WOOLFE: Just in terms of what an orchestra can mean in its community and what they can do in terms of blending the artistic and the social justice, educational, etc., LA's in a league of its own. No one else is commissioning new music and performing new and recent music like the LA Phil. DEL BARCO: Conductor and music director Gustavo Dudamel began at the LA Phil 10 years ago. Now he's planning a permanent home in south LA for his youth orchestra. And he's optimistic about the Philharmonic's future in the global hub that Los Angeles has become. GUSTAVO DUDAMEL: I don't see borders in the art. If we can be an example in these chaotic moments that we are living in the world, art will open this new path that we need. It's a beautiful journey. It's an amazing and unique journey. DEL BARCO: That journey this season includes premiering 50 commissions from as many composers and performing during the Oscars. Mandalit del Barco, NPR News. Transcript provided by NPR, Copyright NPR.